An insidious villain is lurking in the most unlikely of places, your jewelry. Costume jewelry, watches, jean buttons, buckles, coins, and zippers can all cause a skin allergy. It's chomping at the bit to create a host of unpleasant symptoms such as redness, tingling, itching, and unexpected skin irritation. Almost 1 in 10 people have an allergy to nickel or other metals such as lead, chromium and even gold. It’s quite common. Shockingly, 17% of women in North America have a nickel allergy that prohibits them from wearing jewelry without pain. Nickel not only produces the multitude of symptoms listed above but can cause painful blisters and contact dermatitis. It may sound like complex medical terminology, but it's very straightforward. It means our products and procedures are safely designed to eliminate the spreading of infections during piercing. Our products are all manufactured in a modern hygienic facility. We control every aspect of production and all the materials, providing you with sterile medical ear piercing. Created by top jewelry designers in collaboration with skin care professionals and doctors, we make medical piercing earrings for babies, kids and adults. You can select piercing earrings constructed from meticulously chosen medical grade plastic or titanium. For metal earring posts, necklaces and bracelets, we apply a coating to the areas of the jewelry that touches your skin. It’s skin-friendly jewelry that you can wear comfortably all day long. Medical grade plastic contains zero nickel or any metal for that matter. Using plastic removes any chance of experiencing a nickel allergy. Medical plastic is ideal for anyone looking to steer clear of acquiring a nickel allergy or for anyone that has previously had a nickel sensitivity. We enhance our earrings with genuine Swarovski crystals for brilliance and color to match any outfit. No one can tell the earrings are plastic. They are so comfortable, and you’ll forget that you’re wearing them. When it comes to skin safety, medical grade titanium is one of the best materials you can wear. Why? It creates a strong bond with whatever nickel there may be present in the manufacturing process. What does that mean? No nickel enters the skin. Titanium is received exceptionally well by the body and as a result, is used for medical implant applications, frequently supplanting surgical stainless steel. Our medical ear-piercing earrings are not like typical earrings. They are precisely developed to speed up healing. The posts are extra long, and the earring backs attach to the tip. They don’t hug the earlobe which allows for air to circulate and makes it easier to clean. It can take up to a year for the hole to heal completely. Take care when changing earrings so not scratch the newly formed skin. Always wear hypoallergenic earrings, so the hole does not close. “Is there Blomdahl USA medical ear piercing near me?” This is a frequently asked question. Our list of practitioners grows every week. To find one in your area contact us at 1-888-493-5100 or email us at earrings@blomdahlusa.com. 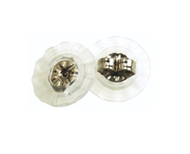 The Blomdahl USA medical ear-piercing system is a sterile method, available only through medical professionals. By using trained professionals, guarantees that the piercing is sterile and safe. Until now, moms, teens and babies with ear sensitivities had to endure unpleasant rashes, redness, tingling, severe itching, and possible skin infection. Thanks to our groundbreaking new medical piercing system, and medical grade hypoallergenic earrings those days are over. You can once again wear pretty earrings knowing that your ears are safe! Blomdahl USA is the safe way to look good every day!